Ever been out to lunch and felt a strange crunch? A crunch that was definitely NOT your sandwich? Only to discover that what you’d been dreading was true: a chipped tooth. Using your teeth for purposes for which they were not meant, like opening bottles. Biting into hard foods, like stone fruit or unpopped corn kernels, particularly if the tooth already has some decay. Bruxing and grinding, which can be a subconscious movement, something that many people simply don’t know that they do. A history of heavily filled teeth or a weakened part of your tooth, which breaks off. An old filling, which has failed from age and fatigue. Falling or being hit in the face. 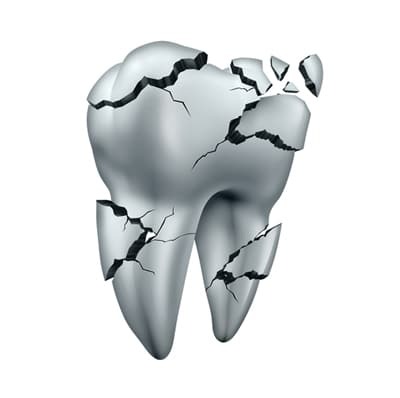 Why Treat a Chipped or Broken Tooth? Your chipped tooth could become damaged further, or even become infected, possibly causing the loss of your tooth altogether. If you do lose your tooth, this may also result in nerve damage, and could kill your nerve completely, followed by the formation of an abscess under your tooth. If this occurs, we can treat the tooth with root canal therapy. In very serious cases, your tooth might split down the middle, into two pieces. If this occurs, unfortunately, we cannot save or salvage your tooth. We’ll need to extract and possibly replace your tooth with an implant. If you are prone to grinding or bruxing your teeth, then it is a good idea to get fitted for an occlusal splint or possibly another type of dental appliance. Wearing a dental appliance will greatly reduce the wear and tear on your teeth, increasing their longevity by years and reducing the likelihood of chipping enormously. Wear a mouthguard during any physical contact sport. Minimise sticky, hard or chewy foods in your diet, avoiding hard foods like corn kernels and ice, and chewy foods that stick to your teeth, like honeycomb. Do not use your teeth to open bottles, or to chew on pens or any other foreign objects. Make sure oral hygiene is top notch, with regular dental visits.